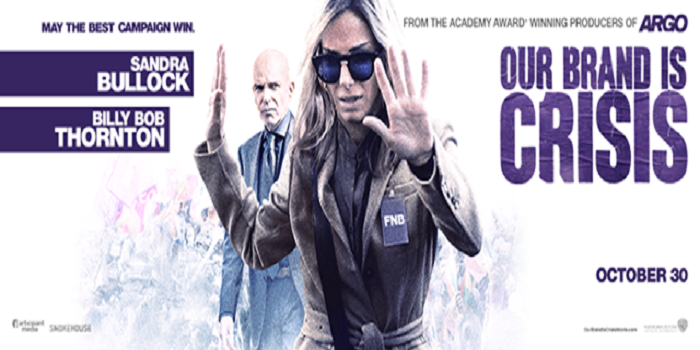 Our Brand is Crisis is a rousing political satire based on a powerful documentary from 2005 of the same name. The film chronicles the battle of wits behind an election campaign in Bolivia. An American adviser, Jane Bodine (Sandra Bullock) nicknamed Calamity Jane, who is well-versed in successful political campaigns, gets roped in to strategise for a losing candidate, the twice elected, unpopular President Castillo. How Jane thwarts the situation in her personal and professional front, thus turning the tables for a favourable result, forms the crux of the narration. The script, written by Peter Straughan. has nothing remotely shocking about the strategies used. The plot plays rather tepidly by not offering much that is new, in terms of the way campaigns are run. The film has a feel of a docudrama since it is designed in a neo-realistic fashion. The setting adds to the aura. The narrative feature, though fictionalised, has elements of honesty brought on by the surroundings that would have otherwise been lacking in a fictionalised setting. But unlike the documentary, director David Gordon Green's film, with a stretch in drama, comedy and scathing dialogues, lands up between fences of mixed reaction, making the film a poor dramedy (drama and comedy). This also means the characters involved in such circumstances have a unique set of sensibilities that give the otherwise unsurprising narrative a twist. Sandra Bullock effortlessly slips into the shoes of the disreputable character Jane Bodine, who is lured out of retirement with ease. Her unkempt and gruff look adds a natural feel to the role. Her justification, "If you fight with monsters for too long, you become a monster too," hopes to tug an emotional chord, but falls flat. The problem lies not with her performance, but with the scope of the character. She is ably supported by Billy Bob Thornton as Pat Candy, who is shepherding the front-runner Rivera to victory. His persona enhances the sliminess of the character he plays. But unfortunately as an opponent, he fails to leave an impact. Reynaldo Pacheco as the humble volunteer Eddie working for Castillo leaves a mark as a disillusioned soul. The others in the cast list are perfunctory. The film fails to create a connection and arouse the intended pathos. Malda clash not communal, says Mamata; Are illegal trade and migration to blame?